An African American man describes life as the son of a white mother and Black father, reflecting on his mother's contributions to his life and his confusion over his own identity. James McBride tells us the story of growing up black, in Harlem, then in projects in the Bronx. Raised by his white mother (his black father died before he was born) and black step-father, he was one of 12 children. He describes a loving family life, where children were expected to be successful, respectful, and STAY IN SCHOOL. Children were due in the house by 5:00 in the evening, and slept 5 to a bed. Dinner might often be a jar of peanut butter or several spoons of sugar. He never met his mother's family and did not discover until he had completed his master's in Journalism at Columbia U, and decided to write a tribute to his mother, that she was jewish, that her family had disowned her, that her father was an orthodox Jewish rabbi who abused her, and just how hard her life had been. The story is told both in the son's and the mother's voices. It is very well-written, and gives us an incredible insight into each mind. James' father was a preacher, and his mother converted to Christianity and insisted on church attendance and prayer from all her children. As he begins to realize that his mother is different from other mothers, he asks her "Is God Black?" "NO" she answers. "Well is he white?" Mom replies in the negative. Still the young boy persists. "Well what color is he?" "The color of water." I just loved that image, and fell in love with this family. As he lovingly recounts his search for his mother's family, and helps her confront a past she has repressed, he comes to an acceptance of his Jewishness, his multi-cultural roots, and gives us a picture of an exceptional family. In the epilogue he gives us a breakdown of the incredible achievements of them all. Every one of the 12 graduated from college. There are two doctors, school teachers, musicians, journalists, nurses, artists, and the mother completes her degree in her late 60's. The Color of Water is an absorbing and moving memoir about the author’s coming of age as a mixed race man with a black father and a Jewish mother who admitted only to having “light” skin. The book is also “A Black Man’s Tribute to His White Mother.” Ruth Shilsky McBride converted to Christianity after she married her first husband and father of the author. But she probably stopped being a Jew when being molested at night by her Orthodox Rabbi father, or when her father finally abandoned her crippled mother for a gentile neighbor, or when richer aunts shunned her (going so far as to declare her dead for marrying a black man). Or, when she found the love, acceptance, and salvation she was seeking all her life among black people. With Ruth’s first husband, Andrew McBride, she had eight children. Following his death of lung cancer, she remarried Hunter Jordan, Sr. and had four more children. The author and his siblings were raised in Brooklyn’s Red Hook housing projects in cramped quarters with no television but lots of pressure from his mother to use their minds. And use them they did, growing up to become doctors, professors, chemists, teachers, and in the author’s case, a writer and award-winning musician and composer. Once James asked his mother, “Am I black or white?” She snapped back at him: “You’re a human being. Educate yourself or you’ll be a nobody!” When the kids were growing up, “Mommy,” as they called her, would lead her long rag-tag group of kids wearing hand-me-downs and hand-outs to the city to every free cultural event offered: festivals, libraries, concerts, exhibits. Author James McBride's mother, Ruth, rarely spoke of her past during McBride's childhood in Queens. McBride knew his mother as a hard-working devout church-going Christian who was determined that all twelve of her children receive a college education. Her past was nothing like her present. Ruth McBride Jordan had been Rachel Shilsky in Suffolk, Virginia, the daughter of an Orthodox Jewish rabbi. Her family had emigrated from Poland to the US in the 1920s when Rachel/Ruth was two. By the time McBride was born, Ruth and her first husband, Andrew McBride, had founded the Brown Memorial Baptist Church in Brooklyn. Ruth eventually opened up her past to her son. He writes his mother's life story in chapters that alternate between McBride's childhood memory of his mother and her recollections of her early life and her transformation from Rachel Shilsky to Ruth McBride Jordan. This was another book I came across while browsing at Barnes & Noble. The story was so inspiring, difficult and humorous at times too. James McBride is a fabulous story teller. 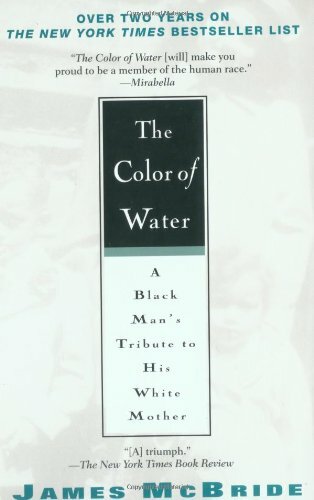 In The Color of Water, McBride goes back and forth between two stories, telling his story growing up as one of eleven children, born to a white mother and black minister father, and his mother's story, growing up as a daughter of an orthodox Jewish rabbi. But eventually, and after repeated pleas, James convinced his mother to tell the story that he and his siblings never knew – or even suspected. She was not only white, but Jewish – the daughter of an Orthodox rabbi. The book is told in alternating chapters – Ruth’s story, and James’s story. McBride doesn’t hold back in this memoir of “A Black Man’s Tribute to His White Mother.” He clearly outlines the missteps and tragedies, as well as the joy and success of his extended family. Think Roots meets An Orphan in History. Subtitled A Black Man's Tribute to His White Mother, this memoir touches on growing up black in America in the sixties; on growing up poor in America; on interracial marriage in the 50's and 60's; on Eastern European Jewry; the Holocaust; Orthodox Judaism in the South; the indomitable spirit of motherhood; love that knows no color; and the ability of human beings to thrive in hostile social environments with "dignity, humility and humor". One of the most touching memoirs you will read about a son's search for his mother's background. Inspirational. A book to be shared with others and passed from hand to hand. This is one of those few books that I felt touched a corner of my soul. Every time I have conversations about race, ethnicity, and idenitity I always find myself drawing on this little gem and passing it along. An inspirational biography of a young Jewish woman who was disowned by her family when she married a black pastor, with whom she had 9 children. When he dies, she married another kind black man and had three more. All 12 rose from poverty to hold advanced degrees and professions. He then looks around to his brothers and sisters and notices their skin. Okay, that seems possible. Some of his brothers and sisters are dark and some are light. Fast forward to James’ junior year in college at Oberlin and he’s filling out forms requiring his mother’s maiden name. Right away James knows this is going to be like pulling teeth. His mother has always avoided questions about her background and this will be no exception. James is just one of twelve siblings who struggle in the depressing conditions of New York City’s Red Hook Projects during the 1960s. It doesn’t help that his mother is the only white woman in the area. He worries for her safety, but she has three rules for her and her children’s success. Always put church and school first, and never tell anyone about your home life. She may be evasive about her past, she may speak a different language when haggling with shopkeepers, she may even be poor and white, but Ruth McBride Jordan manages to see all twelve children through college. Her life is an incredible story and now that James has become a successful journalist it’s time to work that interview magic on Ma. I really enjoyed this book. A biography of the author's mother and her family. The whole read was fascinating. I loved this book. It was very insightful and moving. Since my children are bi-racial, I could identify with the author. It is also something I would recommend my children read when they are older so that they can see how much time changes things. One of my favorites! Although I love the title, The Color of Water, I struggle to say I liked the book. It has some wonderful merits, but I just can't say I loved it either. The author James McBride obviously loves and respects his mother. I think that is heartwarming in itself. Mrs. Ruth McBride (the mother) did an amazing job instilling the value of education in the minds and hearts of her children seeing them all to college. Any mother who raised 12 children to become responsible adults deserves a tribute. The book also includes many fabulous themes for discussion: heritage, identity, religion, faith, parenting, marriage relationships, family hierarchy, race, forgiveness, love, history, etc. There is worth in reading this book particularly along side some other classics like Shakespeare's The Merchant of Venice, Harper Lee's To Kill a Mockingbird, or Martin Luther King Jr's I Have a Dream speech. But somehow this book just didn't reach straight to my heart. I'm not sure why, because I do see so much that is of worth in this book. Perhaps it's because I want more information about Ruth. I want to know more about her relationships with her husbands. I want to know more about her faith. I want to know how her faith changed her. And the book never quite lets me see how that change happened. I see many issues in Ruth's life where she needed the healing influence of Jesus: her molesting and abusive father, her first boyfriend, her abortion, her family abandoning her, etc. But I never get to the heart of how her conversion to Christianity healed the years of hurt. Obviously the woman had great faith that saw her through the years and helped her raise 12 kids. And I began to see a glimpse of it when she told Dennis that she wanted to get married and refused to "live in sin" any longer. But it never went beyond that. What a refreshing book. This is an inspirational story of a mother's tenacity, stubborness and total devotion to her children. I really enjoyed this book, I read with special interest as I'm in an interracial marriage myself, in NY/NJ. Inevitably I wonder about how this will affect my own children. Although times have changed significantly (maybe not as much as they should), and we do live in a multiracial, middle-class community. This is a fascinating book; I'll tell you why. I don't only love this 'cause I'm mesmerized by cultural oriented literature, but also because of the wholesome spirit added in. Sometimes I get bored with straight forward memoirs or biographies, but James Mcbride adds in not only his mother's biography – but also his intricate childhood recollections! I don't know if it'd be the same without that personalized detail added in every other chapter or so – and I know that really helped in keeping my attention growing with each passing page. This is the true story of James McBride and where he came from. He is mixed; his mother is white and his father is black. He tells his story of how he figured out who he was and where he came from.